The Valentine’s Countdown promotion runs until Wednesday the 13th of February (2019) and is simple – you need to opt in (via the ‘Promotions’ section at Mr Smith Casino) and then collect points by playing the qualifying slots. On top of this, you will get 5 cash spins on Net Entertainment’s Finn and the Swirly Spin if you wager at least £50 each day. All cash spins are valid on Finn and the Swirly Spin. As for the qualifying slots, they include Finn and the Swirly Spin, Book of Dead, Extra Chilli and Bonanza. I recommend you play Extra Chilli from Big Time Gaming – with 6 reels and up to 117,649 ways to win, this MegaWays slot is highly volatile. It comes with symbol drops which means winning symbols disappear to be replaced by new ones giving you the chance to win consecutively for free. The Free Spins feature sees winning free spins increase the multiplier by 1 on each win. You can win 20,000 times your stake on each free spin too! 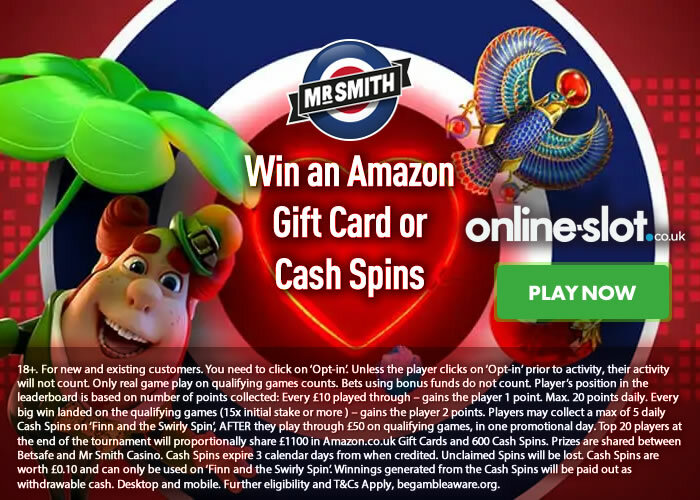 Sign up now at Mr Smith Casino who have more than 1,000 slots to choose from – UK focused, they have all the latest games. They also plenty of exclusive titles like Red Tiger Gaming’s Thor’s Lightning, NetEnt’s Fire Siege Fortress and NetEnt’s Moonshine Riches. Deposit and wager £25, £100 or £200 to get 25, 100 or 200 cash spins on NetEnt’s Starburst. 18+. For new and existing customers. You need to click on ‘Opt-in’. Unless the player clicks on ‘Opt-in’ prior to activity, their activity will not count. Only real game play on qualifying games counts. Bets using bonus funds do not count. Player’s position in the leaderboard is based on number of points collected: Every £10 played through – gains the player 1 point. Max. 20 points daily. Every big win landed on the qualifying games (15x initial stake or more ) – gains the player 2 points. Players may collect a max of 5 daily Cash Spins on ‘Finn and the Swirly Spin’, AFTER they play through £50 on qualifying games, in one promotional day. Top 20 players at the end of the tournament will proportionally share £1100 in Amazon.co.uk Gift Cards and 600 Cash Spins. Prizes are shared between Betsafe and Mr Smith Casino. Cash Spins expire 3 calendar days from when credited. Unclaimed Spins will be lost. Cash Spins are worth £0.10 and can only be used on ‘Finn and the Swirly Spin’. Winnings generated from the Cash Spins will be paid out as withdrawable cash. Desktop and mobile. Further eligibility and T&Cs Apply, begambleaware.org.